This topic contains 20 replies, has 11 voices, and was last updated by cornish-jane 9 months, 2 weeks ago. Hi there, I’m sure I won’t say anything new but I’m overweight and fed up… I have an extraordinarily busy lifestyle with work and child and hubby not always around… I live in a can’t be bothered attitude At the moment when it comes to my health putting everything and everyone first.. time is my enemy.. when I have it I just want to relax not plan food to calorie.. fitting in excerise is hard work.. I just don’t now where to start..
@Saarah5616, welcome. There is a documentary about this, so it probably was the same one you saw. I’ve been doing this 5:2 diet since March 2018. For me, yes, it is working. I almost lost 10 lbs. I plan my FD (fast day) on Tuesday and Thursday. I try to stick around the 500 calories on those days. I drink a lot of water during those two days as it helps with hungry urges. By doing those two days, I leave my weekends open to anything. Of course, you can change your FD any time or way you want. On non-fast days, I eat whatever, but I do try to keep a handle on it. I’ve done WW and count calories in the past and for me, this is the easiest plan to stay on. Check the June blog as you can get lots of encouragement. It also has a chart you can log on for each day and week. One thing different for me is that my goals are small. Instead of saying I want to lose 30+ lbs, I say for the month I would like to lose 5lbs. Yes, Sarah, this is the place to be. My husband tried for many years to lose weight, but when he saw the tv show on the Fast diet, he said, “I think I can do that.” And he did. He lost 45 pounds. You can to. >distract yourself from thinking you are hungry when you aren’t really. 5:2 suits me wonderfully and I lost all my excess weight and am maintaining my healthy weight. The trick to 5:2 involves making it a sustainable, do-able part of your life. It doesn’t matter how fast or slow you lose weight, so long as you are moving in the right direction. Think longterm. Your hectic and stressful life may make it hard. You do need 5:2 to be a priority and do the planning and adjusting to make it work. For some people it is easy, for others it is harder, but determination and support can make it work, so use this forum if you can, to get support and advice. There is a lot of experience here. The bottom line is that, for yourself and your family, things will be better if you can lose the excess weight and keep it off. Hopefully fast days will be easy for you (I love having two days a week I don’t have to think about food) and that your busy life actually helps you by distracting you when you get those hunger waves. It is worth giving it a go anyway! Kay and Fasting-me having given great advice to help. Keen to hear how you go! If you need to ask others for motivation then youre probably not ready to start your health journey yet. It works and it works REALLY well if you combine it with eating healthy foods. If you still choose to eat crap processed foods and do 5:2 it will work for some but not all. Cut out sugar and added sugar as well as processed junk. Do 5:2 and you will be amazed at the results. I lost 22kg (48 lbs). Been in maintenance for about 3 years now. I have no intention of going back. I ow value my health too much. Good luck. It works if you want it to. Actually, to be precise- I have tried this very briefly 4 years ago and gave up really quickly. Now I am determined to give it a proper try. Might not weigh myself in the first couple of weeks. Yes 5:2 works really well. I’ve lost 30kgs so far. Averaging about 2kgs a month, more when i first started. I began 5:2 with pretty low expectations but i got good results and just stayed with it. And now i have changed what i eat, do regular yoga, and am a lot happier and healthier, so lots of other good side effects. – this is a marathon and not a sprint -your normal life carries on 5 days a week and TIME IS YOUR FRIEND. The months pass and you change with them. – ask friends and family to help you – you may convert them and they may help you in return. Go for it – it has been life changing for me. Hi All, thank you so much for the encouragement. I am aware that the motivation ultimately needs to come from myself but hearing your stories is very supportive thank you. As a starter do you have any suggestions on my first few fast days? My doctor recommended that I take a break, which I did, for nearly 6 months. Several weeks ago I started again, doing the 2 days of fasting per week. I am SO glad to be back on it again! I have control back. One day a week keeps me steady. Two days of fasting per week, plan-style, lets me lose weight. I am 78 years old, so I, too, have tried various approaches to weight-loss. This one makes sense. Aging makes my body run slower. Fasting gives my body a chance to ‘catch up’. I feel so much better on the plan. I now hold it as my ideal normal way to live. 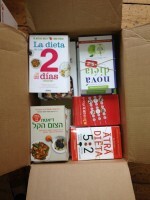 For a person starting the diet, you may find books in the Carbs and Cals series helpful. I have the book ‘Very Low Calorie Recipes and Meal Plans’, by Chris Cheyette, which is no longer in their list of publications. (But others in the series are still available.) Actually, I have settled on a few favorite foods/dishes, which, after 5 days of full eating, are do-able restrictions for the fasting days. @ sarah. Avoid all sugar and added sugar. Avoid processed carbs like bread, pasta, rice, cereals, cakes etc. Doubly so on fast days. Even eating small portions of processed grain based carbs on fast days will make your task almost impossible. Get your carbs from veggies (no potatoes) and some fruit. Eat lots of legumes/beans. Don’t be scared of fats like cheese, avocadoes. Avoid anything that says low fat!! It means high sugar. Avoid fruit juice, pure junk. Avoid breakfast cereals pure junk. Drink lots of water on your fast days. Good luck. You wanted some advice for your first few days. I suggest sticking to the recommended 5:2. This may sound obvious but on these forums you will find people doing all sorts of variations on the theme. You can develop your theme later on with experience if you want to. – My advice is to count calories properly to start with on fast days. I don’t avoid any macro-nutrients (eg fats, carbs, proteins) in particular, just choosing unprocessed foods that I like up to 500 cals per day. – Fast days are easier when you skip breakfast (or have 2 meals a day) then you have 250 calories for each meal and you can eat a decent meal for that. Try and like herbal teas and black coffee, then you don’t have to add milk. – Just ignore hunger or drown it with a drink that you like (my favourite is Marmite tea – really crushes the hunger for a while). Hunger comes in waves and goes away after a while – it does not build up during the day. Tell yourself it is only one day – its easy to diet for one day – and you can have some favourite foods tomorrow. – Have emergency fast day snacks to hand – celery sticks with salt works well! – Keep some control over the non-fast days, as the feast-and-fast-approach could backfire. If you have a good fast day, you find you don’t want to ruin it by pigging out the next day. But this takes time, as you may have to change some bad habits, and give yourself time/space to do it properly so you don’t feel too deprived, otherwise you will give up. – And if you have a lot of weight to lose, don’t expect people to notice until you’ve lost quite a bit (eg 1/3rd of your planned loss). Keep waist and hip measurements too and that will help you keep going! Join us on the monthly challenges if you like! You sound a bit like me. I have gained most of my weight over 18 months of studying nursing. I have 2 kids, husband works long days. I neglect myself in terms of health. I never exercise, and I never learnt to cook. I was raised on fish fingers, comfort foods and convenience food like I lot of people I suppose from busy working families. I have no advice. Just want to commiserate. I am a 61year old female, I started this way of life (WOL) Mid January 2018. I do 17:7 everyday and I do a 37 hour fast starting Sunday until Tuesday at 12:00pm.and again Wednesday night until Friday at noon. I drink 3 to 4 liters of water and mineral water on my fast days and I keep my calories below 500 on fast days. By the first part of May I had lost 20lbs. I reached my goal weight for the month of June I have been doing maintenance and lost an other 2lbs so far for June. I really starting losing weight 2 to 3 pounds each week, I did hit one plateau in March but it was short lived. The best tip I have received from this forum, is to keep your TDEE’s at your goal weight and not your current weight. 5:2 certainly works if you do it correctly and give it a chance. It is not an overnight miracle – it takes some time to lose weight you have gained over many months and years. Hello @sarah5616 – hows your fasting plan going? Come join the July Challenge and see how you it works for you! There really is no easy way to start Sarah. It does involve a level of will power to start with. If you are used to sugars/carbs then that takes about a month to get out of your system. Fasting does get easier after a month. Today is Monday and its my fasting day. No planning required its a water fast. In an earlier post you said you almost fast anyway at work. So just build on that. Avoid any form or processed carb as you snack or better still don’t snack. Drink lots on your fast, eat an apple or carrots. Sarah – I feel for you – as though you are standing by the pool building up the courage to jump in. Just imagine the lovely cool water and how good your body will feel! I suspect you are looking for inspiration – perhaps think of something inspiring you have done before and remind yourself how you do it. – agree in your head 2 weekly fast days, eg Monday and Thursday are popular. – plan 2 meals for each fast day and keep them easy, eg skip breakfast, salad and fruit for lunch and then grilled chicken/fish and green veg for supper. Check the calories initially so you get the quantities right to total 500 cals. Then get into the habit of same shopping, same fast, same days, not too much thinking. After 4-6 weeks you’ll have cracked it and formed a new habit.